But okay, hold up. Let’s be honest. I don’t really know what prayer is. Which is fantastic, remarkable, unfathomable. But this still doesn’t answer the question at hand: what is prayer? Is a brute recitation of the Lord’s Prayer the only means by which we can talk to God? The problem with such examples of prayer (if “problem” is really the right word) is that they focus on the personal aspect of a relationship with Christ. Since the Reformation, Protestantism has been steadily but surely pushing back on the once-held notion that the clergy (pastors, priests, etc) exist as mediators for the laity, the common people, you and me. The reformers (with due credit allotted to the timely invention of the printing press) insisted that all believers can -and should- encounter God through the Scriptures, receive him in the sacraments and approach him in prayer. Faith- and with it prayer- became personal. Which is good, wonderful, necessary, and Biblical. But, as with all things, needs a dose of moderation. 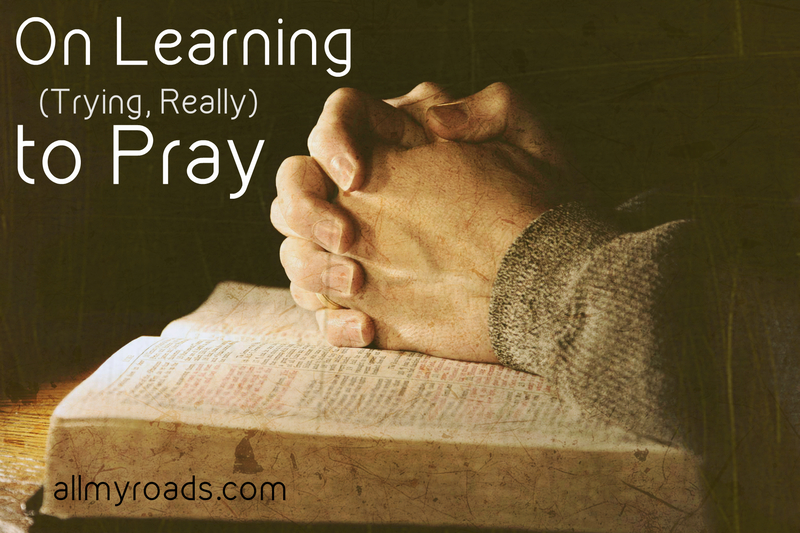 Because when prayer becomes just a personal endeavor, when prayer is removed from the context of communal faith, we also lose our framework for how to actually pray. For prayer brings the believer into the community of the saints. The words “Dear Lord,” “Our Father”, “Precious Jesus kind and good (…)”; these words unite us to the confessing Church, like a college’s fight song unites its alumni. Prayer is not a matter of enhancing a personal relationship with Christ, boxing out everyone and anything and focusing entirely on his relationship with you. Rather, prayer is the act of taking the hands of believers before and around you, of approaching God’s throne as a member of his bride, the Church. The words I mutter at church, the thoughts I think (intentionally, aimed towards God who- best as I can imagine- is somewhere in the sky) at night, the Psalms I read, the times I yell in anger, shout with joy, laugh, dance, run- the flutters of goodness, hope, gratitude and praise that lift from my inner being…these do not isolate me as a believer in a personal relationship but identify me as a member of the universal Church. In other words: prayer is personal, but it is also something so much more than just the expression of a single bond between myself and Christ. Every member of the choir matters; but it’s the joining of their voices in harmony and unison that the bridegroom has come to hear. And this is of great comfort to me as I’m learning (trying, really) to pray. Because suddenly my conversation with Christ does not rely on me. When prayer is seen as something much greater than my own direct line to Christ, when prayer is understood as a joining of voices, my shouts of “hurrah!” rising with the thousands, then prayer does not end when I open my eyes, think about dinner, speed-read the Psalms or forget to mutter my grocery lists of requests and praises prior to going to bed. When prayer moves outside of something that I control and into something in which I participate, then the act of trying to pray is itself caught up grace. Prayer is not a pre-paid phone line between myself and Christ; the conversation goes on even when I hang up, or perhaps cannot bring myself to call. Which is why prayer is not a test. The Tabernacle, Levitical law, Old Testament sacrificial system… if anything was, these were the test between God and his people, a test no one can pass. Except Christ. And when he aced the test, when he died on the cross, he opened up a channel of accessibility between God and his people. Prayer- this conversation with God- is a reflection of our relationship to God; and so it hinges on his work, not ours. Prayer, ultimately, is not something we do, but something we accept, and partake. We accept God’s desire for a relationship with his bride, the Church. We accept our role in said Church, the community of saints, the gathering of sinners now redeemed. We accept the conversation occurring between the Creator and created of which we are a part. We accept and the acceptance, the acknowledgement, the bowed head, still moments, whispered Psalms, and shouts of “hallelujah!”, these actions are not our own but are Christ’s. They are Christ’s who works in grace and through the believer in very act of prayer itself. And so I do want to pray. And I’m always learning different ways: reading the Psalms aloud, five every day, the entire Psalter each month; repeating liturgical phrases (“Lord have mercy, Christ have mercy”; “the Lord bless you and keep you”; “the word of the Lord, thanks be to God!”) every spare moment of every day; sitting in silence and awe of his creation: a park bench, a food court in the mall, a scenic overlook, a sandy beach; closing my eyes and thinking thoughts directed to a God who wants to be known but- at the same time- one could never comprehend. And with every breath I’m all the more thankful that the prayer does not depend on my technique, effort, desire, or even purity of heart. Instead it depends on Christ. And therefore it is heard.